Wireless keyboards might be all the rage, but just about every model has one major flaw: running out of power. Having to look for a pair of freshly charged batteries while trying to meet a deadline or hand in a term paper is not fun. While some manufacturers have created rechargeable solutions, having to plug-in with cables is still a hassle for some users. Fortunately, the eco-friendly Logitech Solar Wireless Keyboard (K750) comes to the rescue with a simple solution. 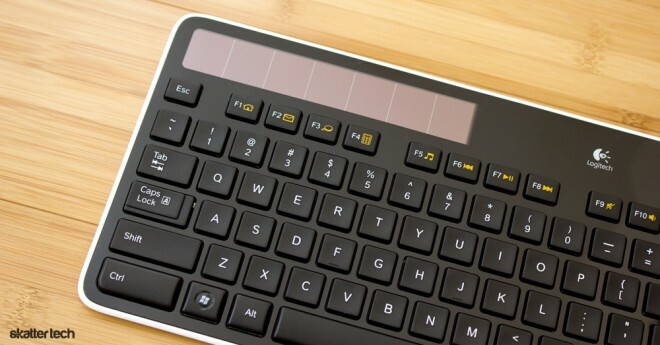 Assuming that there is a decent amount of sunlight or artificial light, this keyboard claims to keep on going. I love plug-and-play, period. Once I pushed the tiny USB receiver into my Windows 7 laptop, the keyboard began working within a few seconds. I hate installing third-party software even if from a trusted source and I was glad to find that even function keys for launching the default web browser, email client, system search, and calculator work right out of the box. There are also function key shortcuts for launching the default media player and controlling playback. Volume adjustments and the mute key work perfectly as well. A power button can put your computer to sleep instantly. I also plugged the keyboard into an iMac running Mac OS X and getting setup was just as simple: doing nothing. The Windows key turns into an Apple key, but you will have to ignore the physical logo on the hardware. All the bonus extra functions also work, which was a pleasant surprise. I launched Safari with a single click, skipped songs in iTunes, and controlled volume with no issues. The power key even brings up a list of options to restart, shut down, or make the computer sleep. This keyboard even worked on my Google Chrome Notebook with no trouble. The Logitech Unifying Receiver technology is also a wonderful feature and deserves some recognition. 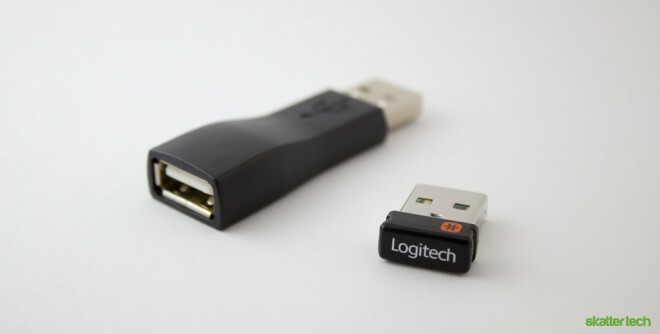 As a Logitech Anywhere MX user, I already had one of these plugged into my laptop’s USB port. It took me about 5 minutes to grab a little app from the company’s website and pair my new solar keyboard with the existing USB unifying receiver. I soon freed up an extra USB port, making room for other gadgets. This universal technology works with most recent Logitech products. 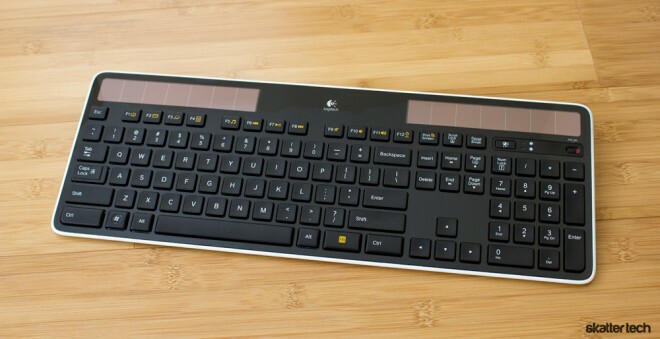 The Logitech Solar Wireless Keyboard is quite thin. Although it is probably not as robust as the aluminum build on Apple keyboards, the plastic body is fairly strong. The backside is entirely white with edges that carry over to the front. The keys have a smooth matte black finish, but the entire front side features a glossy coat. This unfortunately makes a keyboard a fingerprint magnet and Logitech even includes a cleaning cloth in the packaging. While the keyboard does look quite fancy, especially with retro solar panels at the top, it can become quite nasty with no maintenance. For those wondering, this keyboard is about 17 inches wide, which is about the average length for desktop sized solution. Keep in mind it has a keypad on the side as well. It also extends about 6 inches long with at least an inch reserved for the solar panels at the top. Unlike most full sized keyboards, this one sports flat keys. It feels like typing on a Sony VAIO or an Apple MacBook. As someone who prefers this style, I found myself typing faster than ever. I took less than a few minutes to get used to the new layout, which is a major plus. There are no oddly shaped or misplaced keys. The buttons have a decent tactile click and require just the right amount of push. 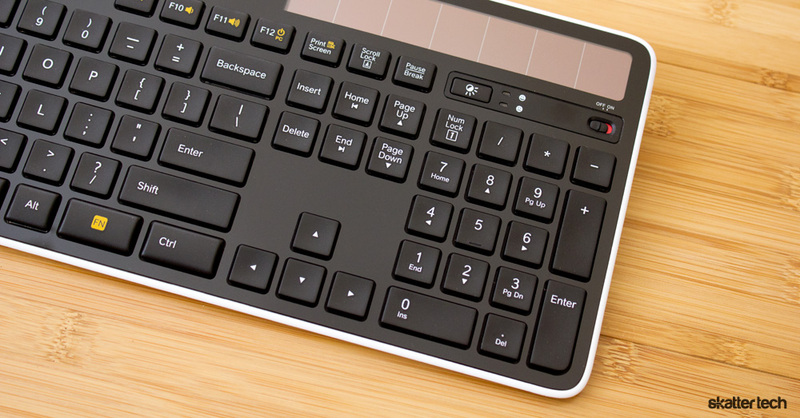 There is no ergonomic curvature or special layout which other Logitech keyboards feature. This solar-powered model does not have a back-lit feature like the Logitech Illuminated Keyboard for obvious power conserving reasons. While it can make typing in the dark easier for average users, it is also distracting for heavy users who no longer need to look at their keyboard. According to Logitech, this keyboard can keep on running for nearly three months in the dark. Since the keyboard is so thin, there is no compartment for AA or AAA batteries. A Maganese Lithium button cell rechargeable tucks away into the top and is something you will likely never replace. It can take as little as two hours for a full recharge under direct sunlight. Keep in mind that even a desk lamp, over head lighting, or natural lighting that fills a room can keep energizing this keyboard. There is a power button at the top to conserve power when not in use. A quick status check button displays either a green or red light besides a smiley or frowning face, respectively, to indicate whether the current light source provides adequate power. Logitech offers a neat little applet to gather more information about the keyboard. Pressing the status key brings up a window with a percentage of available power and the level of the energy reserve. Interestingly enough, there is also a light intensity meter at the top. Holding it up to a lamp boosted it to a full 500 lux and there was about 125 lux in a room with natural sunlight (not direct). Logitech recommends at least 100 lux for normal operation, which I do not think will be an issue. As someone who works on a computer for a living, this keyboard is a godsend. Even casual users will appreciate not having to worry about replacing batteries each time their keyboard runs out of power. The hassle-free configuration is a major plus especially for those who are not too tech savvy. I also enjoyed that the unifying receiver pairs with my mouse as well, saving me an extra USB port. Although I did not have three months to test the claimed battery life, I think that decent lighting through the day will keep it charged indefinitely. It would be nice to see a USB port on a future model for wiring in to get a quick recharge when out of power and left without adequate light. The Logitech Solar Keyboard K750 sells for $79 which is a bit pricey, but it is available for as little as $55 if you shop around. This is definitely premium product and it is something that will not let you down.